beta = nlmefit(X,y,group,V,fun,beta0) fits a nonlinear mixed-effects regression model and returns estimates of the fixed effects in beta. By default, nlmefit fits a model in which each parameter is the sum of a fixed and a random effect, and the random effects are uncorrelated (their covariance matrix is diagonal). X is an n-by-h matrix of n observations on h predictors. y is an n-by-1 vector of responses. group is a grouping variable indicating m groups in the observations. group is a categorical variable, a numeric vector, a character matrix with rows for group names, a string array, or a cell array of character vectors. For more information on grouping variables, see Grouping Variables. V is an m-by-g matrix or cell array of g group-specific predictors. These are predictors that take the same value for all observations in a group. The rows of V are assigned to groups using grp2idx, according to the order specified by grp2idx(group). Use a cell array for V if group predictors vary in size across groups. Use  for V if there are no group-specific predictors. PHI — A 1-by-p vector of model parameters. k = 1 if XFUN is a single row of X.
k = ni if XFUN contains the rows of X for a single group of size ni. k = n if XFUN contains all rows of X. A 1-by-g vector corresponding to a single group and a single row of V.
An n-by-g array, where the jth row is V(I,:) if the jth observation is in group I. If V is empty, nlmefit calls modelfun with only two inputs. When either PHI or VFUN contains a single row, it corresponds to all rows in the other two input arguments. If modelfun can compute yfit for more than one vector of model parameters per call, use the 'Vectorization' parameter (described later) for improved performance. beta0 is a q-by-1 vector with initial estimates for q fixed effects. By default, q is the number of model parameters p.
Random effects are multivariate normally distributed and independent between groups. Observation errors are independent, identically normally distributed, and independent of the random effects. [beta,PSI] = nlmefit(X,y,group,V,fun,beta0) also returns PSI, an r-by-r estimated covariance matrix for the random effects. By default, r is equal to the number of model parameters p.
M is the number of groups. numParam and logl are defined as in aic. Note that some literature suggests that the computation of bic should be , bic = –2*logl + log(N) * numParam, where N is the number of observations. [beta,PSI,stats,B] = nlmefit(X,y,group,V,fun,beta0) also returns B, an r-by-m matrix of estimated random effects for the m groups. By default, r is equal to the number of model parameters p.
[beta,PSI,stats,B] = nlmefit(X,y,group,V,fun,beta0,'Name',value) specifies one or more optional parameter name/value pairs. Specify Name inside single quotes. Use the following parameters to fit a model different from the default. (The default model is obtained by setting both FEConstDesign and REConstDesign to eye(p), or by setting both FEParamsSelect and REParamsSelect to 1:p.) Use at most one parameter with an 'FE' prefix and one parameter with an 'RE' prefix. The nlmefit function requires you to specify at least one fixed effect and one random effect. A vector specifying which elements of the parameter vector PHI include a fixed effect, given as a numeric vector of indices from 1 to p or as a 1-by-p logical vector. If q is the specified number of elements, then the model includes q fixed effects. A p-by-q design matrix ADESIGN, where ADESIGN*beta are the fixed components of the p elements of PHI. A p-by-q-by-m array specifying a different p-by-q fixed-effects design matrix for each of the m groups. A p-by-q-by-n array specifying a different p-by-q fixed-effects design matrix for each of the n observations. A vector specifying which elements of the parameter vector PHI include a random effect, given as a numeric vector of indices from 1 to p or as a 1-by-p logical vector. The model includes r random effects, where r is the specified number of elements. A p-by-r design matrix BDESIGN, where BDESIGN*B are the random components of the p elements of PHI. A p-by-r-by-m array specifying a different p-by-r random-effects design matrix for each of m groups. A p-by-r-by-n array specifying a different p-by-r random-effects design matrix for each of n observations. Determines whether nlmefit makes an initial refinement of beta0 by first fitting modelfun without random effects and replacing beta0 with beta. Choices are 'on' and 'off'. The default value is 'on'. 'LME' — Use the likelihood for the linear mixed-effects model at the current conditional estimates of beta and B. This is the default. 'RELME' — Use the restricted likelihood for the linear mixed-effects model at the current conditional estimates of beta and B. 'FO' — First-order Laplacian approximation without random effects. 'FOCE' — First-order Laplacian approximation at the conditional estimates of B. 'SinglePhi' — modelfun can only accept a single set of model parameters at a time, so PHI must be a single row vector in each call. nlmefit calls modelfun in a loop, if necessary, with a single PHI vector and with XFUN containing rows for a single observation or group at a time. VFUN may be a single row that applies to all rows of XFUN, or a matrix with rows corresponding to rows in XFUN. This is the default. 'SingleGroup' — modelfun can only accept inputs corresponding to a single group in the data, so XFUN must contain rows of X from a single group in each call. Depending on the model, PHI is a single row that applies to the entire group or a matrix with one row for each observation. VFUN is a single row. 'Full' — modelfun can accept inputs for multiple parameter vectors and multiple groups in the data. Either PHI or VFUN may be a single row that applies to all rows of XFUN or a matrix with rows corresponding to rows in XFUN. This option can improve performance by reducing the number of calls to modelfun, but may require modelfun to perform singleton expansion on PHI or V.
Specifies the parameterization used internally for the scaled covariance matrix. Choices are 'chol' for the Cholesky factorization or 'logm' the matrix logarithm. The default is 'logm'. Specifies an r-by-r logical or numeric matrix P that defines the pattern of the random-effects covariance matrix PSI. nlmefit estimates the variances along the diagonal of PSI and the covariances specified by nonzeros in the off-diagonal elements of P. Covariances corresponding to zero off-diagonal elements in P are constrained to be zero. If P does not specify a row-column permutation of a block diagonal matrix, nlmefit adds nonzero elements to P as needed. The default value of P is eye(r), corresponding to uncorrelated random effects. Alternatively, P may be a 1-by-r vector containing values in 1:r, with equal values specifying groups of random effects. In this case, nlmefit estimates covariances only within groups, and constrains covariances across groups to be zero. 'DerivStep' — Relative difference used in finite difference gradient calculation. May be a scalar, or a vector whose length is the number of model parameters p. The default is eps^(1/3). 'FunValCheck' — Check for invalid values, such as NaN or Inf, from modelfun. Choices are 'on' and 'off'. The default is 'on'. 'MaxIter' — Maximum number of iterations allowed. The default is 200. 'OutputFcn' — Function handle specified using @, a cell array with function handles or an empty array (default). The solver calls all output functions after each iteration. 'TolFun' — Termination tolerance on the loglikelihood function. The default is 1e-4. 'TolX' — Termination tolerance on the estimated fixed and random effects. The default is 1e-4. 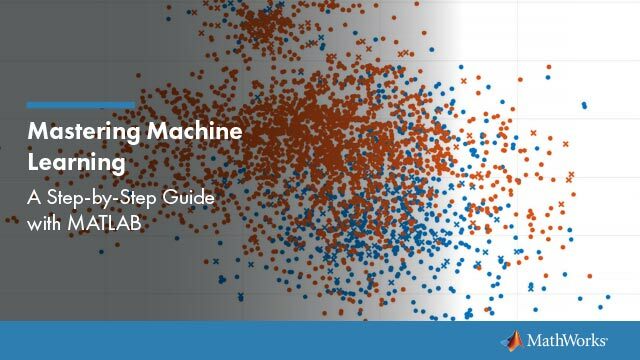 Specifies the optimization function used in maximizing the likelihood. Choices are 'fminsearch' to use fminsearch or 'fminunc' to use fminunc. The default is 'fminsearch'. You can specify 'fminunc' only if Optimization Toolbox™ software is installed. 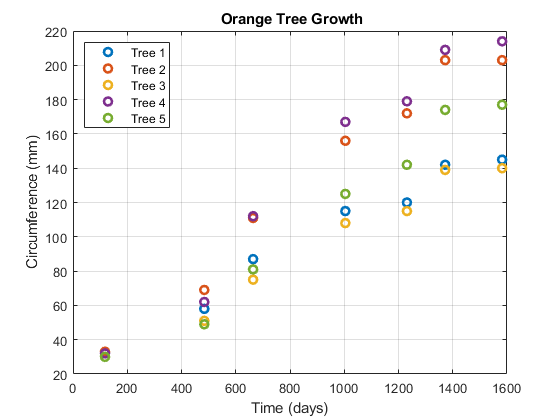 Enter and display data on the growth of five orange trees. Use an anonymous function to specify a logistic growth model. The negligible variance of the second random effect, PSI1(2,2), suggests that it can be removed to simplify the model. The loglikelihood logl is unaffected, and both the Akaike and Bayesian information criteria ( aic and bic ) are reduced, supporting the decision to drop the second random effect from the model. 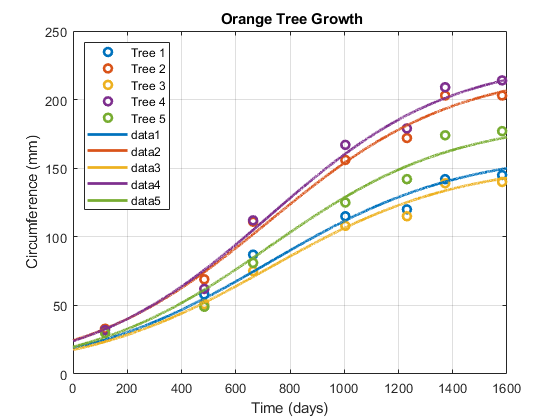 Use the estimated fixed effects in beta2 and the estimated random effects for each tree in b2 to plot the model through the data. Lindstrom, M. J., and D. M. Bates. “Nonlinear mixed-effects models for repeated measures data.” Biometrics. Vol. 46, 1990, pp. 673–687. Davidian, M., and D. M. Giltinan. Nonlinear Models for Repeated Measurements Data. New York: Chapman & Hall, 1995. Pinheiro, J. C., and D. M. Bates. “Approximations to the log-likelihood function in the nonlinear mixed-effects model.” Journal of Computational and Graphical Statistics. Vol. 4, 1995, pp. 12–35. Demidenko, E. Mixed Models: Theory and Applications. Hoboken, NJ: John Wiley & Sons, Inc., 2004.